Gas is annoying, embarrassing, and uncomfortable. It can be caused by anything from improper chewing and spicy foods, to excessive drinking, stress, and bacterial infections. There are plenty of over-the-counter medicines that treat gas and the bad breath, bloating, belching, and stomach pain that can accompany it. But why deal with the side effects when you can treat gas using simple ingredients you already have at home? The methods listed in this article are safe and effective, and they cost less than commercial treatments. Try all these home remedies until you find the one that works best for you. Cinnamon helps to soothe the stomach and promotes proper digestion. Stir ½ teaspoon of cinnamon and ½ teaspoon of honey into a cup of warm milk and drink. Repeat whenever necessary to get relief from gas. Mix 1 teaspoon of cinnamon in a cup of boiling water. Let steep for 10 minutes and drink. Ginger contains gingerols and shogals that relax the intestinal tract and relieve inflammation. It cures indigestion and helps to reduce the gas. Boil water and stir in 1 teaspoon of ground ginger. Use ginger in your cooking frequently to prevent gas. Chew fresh ginger after every meal to relieve gas. Mix ginger essential oil and any carrier oil and rub on stomach. Mix 1 teaspoon of ginger juice and 1 teaspoon of sugar into a glass of hot water. Drink this to cure the problem. Fennel is an anti-spasmodic that relaxes the digestive tract to allow gas to escape more easily. Chew fennel seeds after meals or follow the processes below. Boil water and add 1 tablespoon of fennel seeds. Strain and drink to get rid of gas. Boil water and stir in 1 tablespoon of fennel seeds, a handful of fresh mint, and a few cardamom leaves. Boil water and stir in 1 tablespoon of fennel seeds and 1 regular tea bag. Add ¼ cup of milk and 2 tablespoons of jaggery syrup and stir. Asafetida is anti-spasmodic. It relieves cramps and relaxes the digestive tract. Stir a pinch of asafetida in a glass of warm water and drink. Repeat 2 times daily to get instant relief. Mix 1 teaspoon of asafetida with enough water to make a paste. Apply it to your stomach and let dry. Insert 1 teaspoon of asafetida into a ripe banana and eat it. Peppermint relaxes the digestive tract to relieve cramps and allow gas to pass easily. Chew fresh peppermint after meals or follow the recipes below. Boil a cup of water and stir in 5-6 peppermint leaves. Strain, stir in honey to taste, and drink. Mix 3 drops of peppermint oil into ½ cup of cool water. Black pepper stimulates the production of saliva, gastric juices, and hydrochloric acid, which aid in proper digestion. Mix ½ teaspoon of black pepper powder with crushed jaggery. Stir the mixture in ½ cup of buttermilk. Mix equal quantities of black pepper, dried mint leaves, ginger powder, and coriander seeds. Grind these into a fine powder. Take 1 teaspoon of this powder 2 times a day and whenever you need relief from gas. Garlic promotes proper digestion. Use it in your cooking regularly, chew fresh garlic cloves after meals, or follow the method outlined below. Boil water and stir in ½ tablespoon of minced garlic, ¼ teaspoon of black pepper, and ½ teaspoon of cumin seeds. Cardamom accelerates the digestive process and helps to reduce the gas. Use it in your cooking regularly to prevent gas, chew cardamom pods after meals, and follow the recipe below. Boil a cup of water and stir in 3 cardamom pods, ½ teaspoon minced ginger, and 1 teaspoon fennel. Apple cider vinegar helps to regulate the digestive process and prevent gas. Stir 2 tablespoons of apple cider vinegar into a glass of water. Drink whenever you need relief from gas. Caraway seeds relieve cramps and regulate the digestive process and prevent the gas. Roast caraway seeds and season them with rock salt or make tea using the recipe below. Boil a cup of water and stir in 1 teaspoon of caraway seeds. Remove from heat, let steep 10 minutes, and strain. Lemon contains vitamin C which gives relief from the gas. 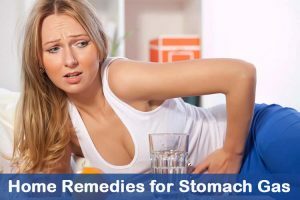 Baking soda and lemon help to neutralize stomach gasses. It works as effective antacid. Squeeze the juice from one half into a glass of water. Add ½ teaspoon of baking soda and stir until it dissolves. Alma is rich in fiber, which regulates acid levels in the stomach. Eat this regularly to treat gas and other problems like constipation, heart, stomach pain etc. Ajwain, also known as carom, ajowan, or bishop’s weed, helps to regulate the digestive system to relieve nausea and flatulence. Chew the seeds after meals and wash them down with water if it potent odour makes it hard to consume, or you can add half teaspoon of seeds to rice by mixing salt and asafetida. Regularly consume 5 – 10 seeds to get cure from gas and other stomach problems. The lactic acid in buttermilk accelerates the digestion process, and regulates the digestive system. Bacteria in the buttermilk boost digestive system to function properly. Mix roasted or powdered cumin seeds into a glass of buttermilk and drink. Cloves contain a chemical called eugenol, which neutralizes stomach acid to releive flatulence and bloating. Chew a few cloves after meals and wash them down with water. Your diet plays a major role in either causing or preventing gas. Follow the recommendations below to avoid it. Avoid broccoli, Brussels sprouts, oats, potatoes, cabbage, cauliflower, dried beans, and foods that contain yeast, like bread. Eat eggs, cheese, meat, peanut butter, and yogurt. Drink warm water whenever you get indigestion or gas. Regular intake of warm water will also help to retain the water levels in your body. Drink lemon juice to relieve gas. Eat slowly and chew thoroughly helps for better digestion. Avoid chewing gum, hard candies, and drinking through a straw as these promote intake of air. Don’t eat when you’re stressed, anxious, angry, or on the go. Avoid smoking cigarettes because you swallow more air and makes indigestion and creates gas problem..
Eat pumpkin regularly as it reduces the formation of gas. Eat a cup of baked or steamed pumpkin. Try other herbal teas like chamomile, mint, etc. If you continue to get gas, consult a doctor. These home remedies will help you avoid the discomfort and embarrassment of gas without spending money on commercial products. Let us know which ones work best for you! Not sure if it’s a good idea, but I just whipped all of this up in one brew. Tasty that’s for sure.